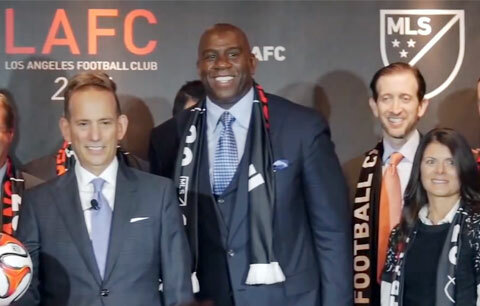 “Los Angeles is a diverse, vibrant market with millions of soccer fans, and we look forward to an intense rivalry between the Galaxy and Los Angeles Football Club,” MLS Commissioner Don Garber said. Besides Johnson and Hamm, a diverse group of part owners include Ruben Gnanalingam, co-owner of the English Premier League’s Queens Park Rangers, Vincent Tan, owner of the Football League Championship’s Cardiff City and FK Sarajevo of the Premier League of Bosnia and Herzegovina, Larry Berg, co-owner of AS Roma and Bennett Rosenthal, co-owner of AS Roma. Other investors include Nomar Garciaparra, former MLB star; Rick Welts, President and COO of the Golden State Warriors NBA team; as well as Allen Shapiro, Chad Hurley, Kirk Lacob, Mark Leschly, Mike Mahan, Irwin Raij, Paul Schaeffer, Brandon Schneider, Jason Sugarman, Tony Robbins and Harry Tsao, will join the new venture. Magic Johnson, who is also a part owner of the Los Angeles Dodgers, is no stranger to entrepreneurship and Mia Hamm, who played for many years as a forward for the United States women’s national soccer team, are both excited in their new venture. Playing Field Promotions is a booking agent for motivational sports speakers and celebrities. If you would like to book Magic Johnson or Mia Hamm for a speaking engagement or personal appearance, contact our booking agent for appearance & speaker fees at 1.800.966.1380.